The tubing on the Pelican uses double butted “standard” diameter top tubes and downtubes/seattubes. 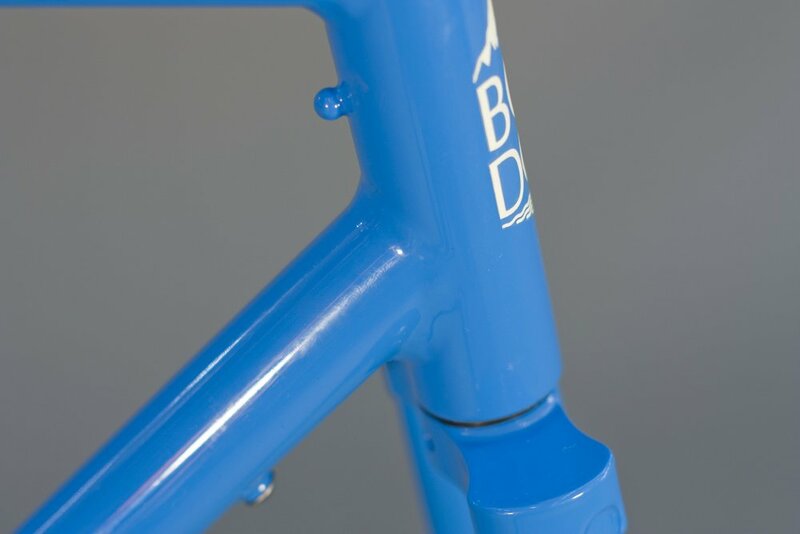 “Standard” diameter refers to a toptube that is 25.4mm in diameter, and the down and seattubes are 28.6mm. All properly made steel frames should have a TT that is smaller in diameter than the down or seattubes. The butting of the tubes is .8/.5/.8mm for the TT and .9/.6/9 for the other main tubes. This thinner wall tubing and smaller diameter allows for a comfortable amount of frame flex and spring. These specifcations are important for comfort over the long miles, and allows a tired rider to spin up for a long climb or for keeping momentum through a series of rollers. 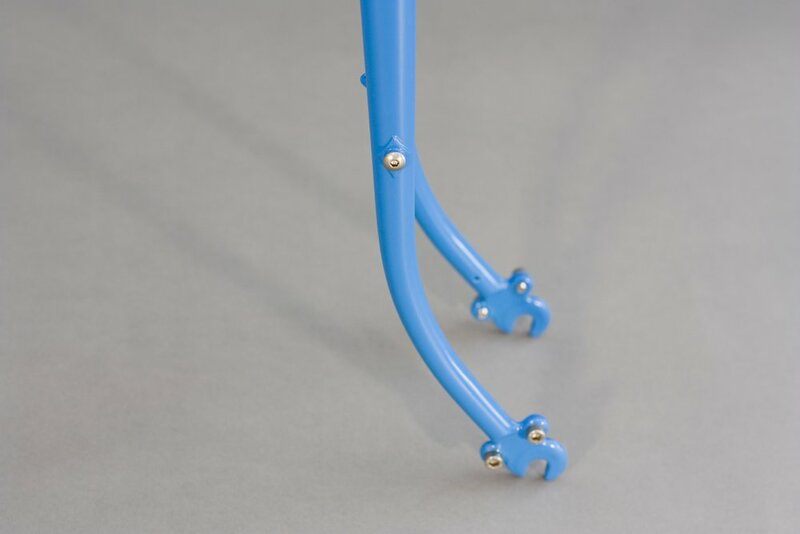 A flexy frame helps spring or “plane” the bike as opposed to pushing back against the rider. Admittedly, a springy frame is not good for prolonged all-out sprints (time trialing) or crits. 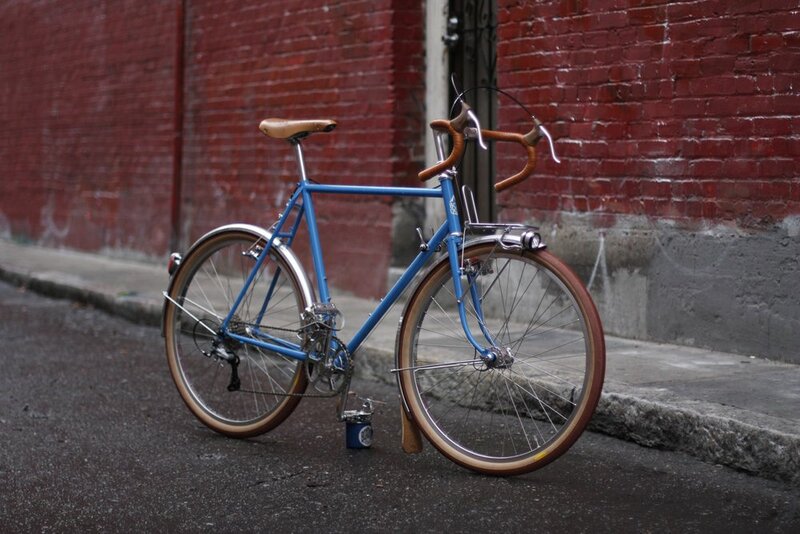 The tubing of the Pelican will ride similarly to Colombus SL or Reynolds 653 equipped road bikes. The lighter gauge tubing is what helps set the Pelican more in the randonneur camp than that of touring or townie bikes. Both of those styles of frames require stiffer frames to handle carrying the loads they are intended to carry. 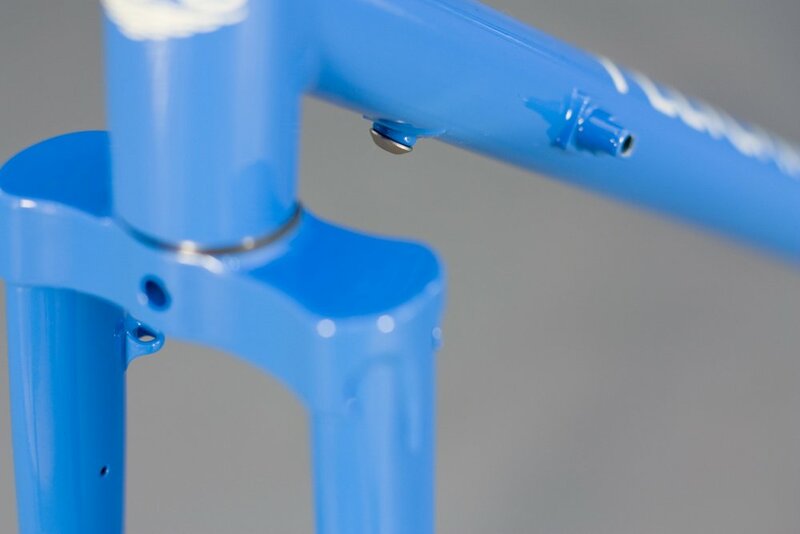 The Pelican is more in line with stage race frames, or arguably cross frames. Although, keep in mind modern cross frames are quite stiff so that the racer can still hammer through the course and not have the bike flexing all over the place when going over rough terrain at race speeds. Realistically the Pelican rides more like the old cross bikes and stage race bikes of the 60’s-80’s. Up until recently the frameset was fully brazed by Winter Bicycles. As of now, production has moved into the hands of two builders, Joseph Ahearne and Christopher Igleheart, who both share shop space in Portland, Oregon. 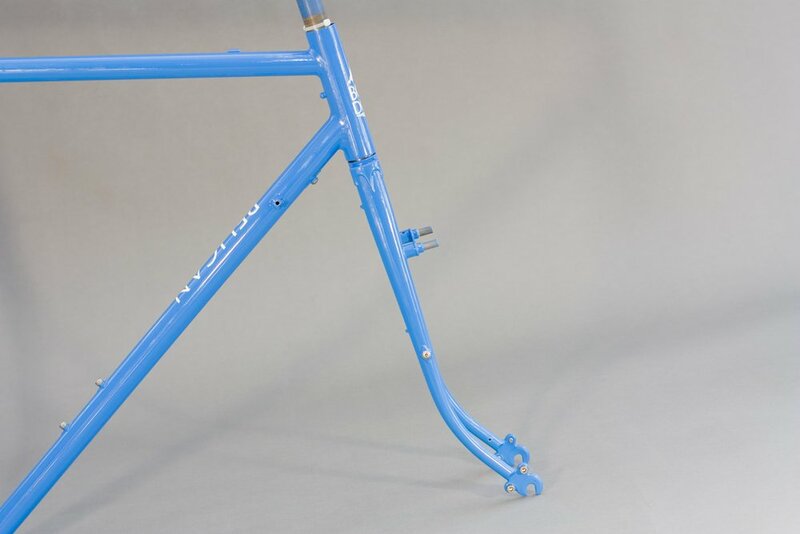 Under their construction, the Pelicans will have a TIG-welded main triangle, lugged fork, and brazed seat stays. The headset and steerer tube require a 1” threaded headset. This enables easier stem and bar height adjustments on the road (if needed). It also works better aesthetically with the standard diameter tubing and overall classic French look of the Pelican. Never fear, it is still very easy to find high quality 1” threaded headsets and stems, many of which we stock at Box Dog. A 1” threaded steerer tube/fork/stem/headset is also of comparative weight to a bike with a steel, threadless fork, if not a bit lighter. The Pelican is designed with low trail geometry, permitting the rider to carry a small front rack to support their handlebar bag. Having a bag in front is great for ease of access to the bags contents, as well as easy reading of any cue sheets or maps in the bag’s attached map case. You don’t have to stop and pull over to access your bag in order to pull out or put in clothing & food. If you do stop, you don’t have to get off the bike or twist around to get at what you need (as with a pannier or saddlebag). The Pelican can also take a lowrider front rack for carrying panniers. This extends the range and utility of the bike. Now imagine you can go on short camping trips or carry more clothes and supplies for longer brevets or adventures. Remember though, the Pelican is not a touring bike, and while you can also mount a rear rack, to help carry lighter bulky loads, you should not carry the kitchen sink and go on an extended, expedition-style tour. Think light loads ~ 30-40lbs+hbar bag, with a 60/40 or 70/30 front/rear load distribution. The fenders keep water, mud, and gunk off the bike and rider. The Pelican is designed with good fender lines which not only have a pleasing appearance, but are safer than poor fender lines where tight spots between tire and fender could allow objects to jam. Correct fender lines and bridge spacing also allows for easy installation of wheels when fixing flats, especially when combined with vertical dropouts. If the fenders are too close to the tire, it will be hard to get an inflated tire and wheel in and out of the frame. If the fenders are warped out of shape in order to fit, this can lead to undue stresses on the fenders leading to noise and premature breakage. The Pelican has vertical dropouts. Maximum tires size with fenders installed is 650bx42mm. Cantilever brakes allow wide tires and fenders, offer strong stopping power, exist in a plethora of brands, prices, and designs; unlike centerpull or sidepull caliper brakes. Cantis also benefit from being mounted to brazed posts which helps alleviate flex found in most other calipers (except brazed on centerpulls). Centerpulls are good brakes but are extremely limited in availability/options. Only Paul Components offers new braze-on or crown/bridge post mount (the braze-on mount brakes limit the frame to ONLY these Paul brakes by requiring a special frame and fork). NOS Mafac centerpulls also preclude a custom frame&fork, or one can use sub optimal post mount Dia-Compes or post mount Mafacs. Cantis also are cross compatible with many different brake lever or integrated shifter controls unlike side pull, v-brake, or discs (for now). We offer the Pelican in 650b wheel sizes for the full size run of 50-62cm. 650b is an old and good wheel size made and championed by the French long ago. The biggest boon for 650b is the ability to run large volume tires without running a very small wheel (like 26”), or negatively affecting ride and fit (700c). Running a 26” wheel does have some speed penalties compared to 650b or 700c. 650b wheels using 36mm width tires or bigger run a comparative diameter to a 700x23 equipped wheel, but with more pneumatic suspension. With 650b and a properly designed and built frame, even a 50cm frame can run 42mm tires with fenders. With 650b you can easily ride, at speed, from pavement to gravel/dirt, and back again without having to adjust tire pressure or worry about pinch flats or broken spokes. 650b is also supremely comfortable over rough pavement, chip seal, gravel, pave, etc. The drawbacks to 650b is the limited access to rims and tires, but there is a strong & small market for this that has been growing over the past ten years. Many choose 650b for it’s comfort and riding versatility regardless of the supply chain. cantilever brake posts and housing stops. standard down tube shifter bosses. mid fork "low-rider" rack mounts. 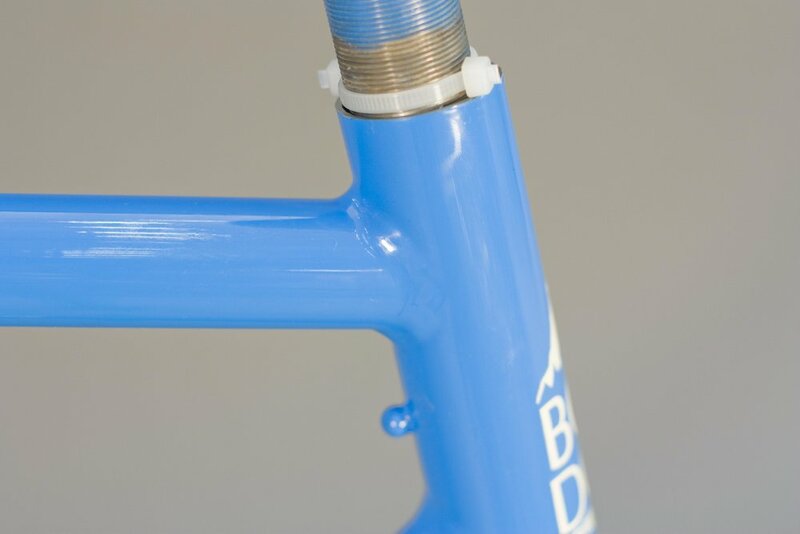 a pump peg behind the head tube. 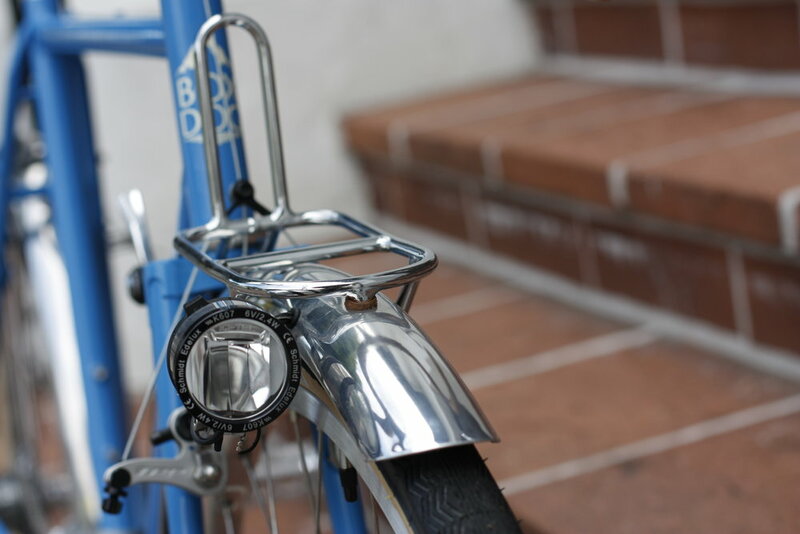 a built in threaded mount under the fork crown for direct fender mounting (no more need for a “daruma” eye-bolt). evenly spaced chain and seat stay bridges for proper fender lines. loops for generator light wiring on the fork blade. internal wire routing through the down tube. 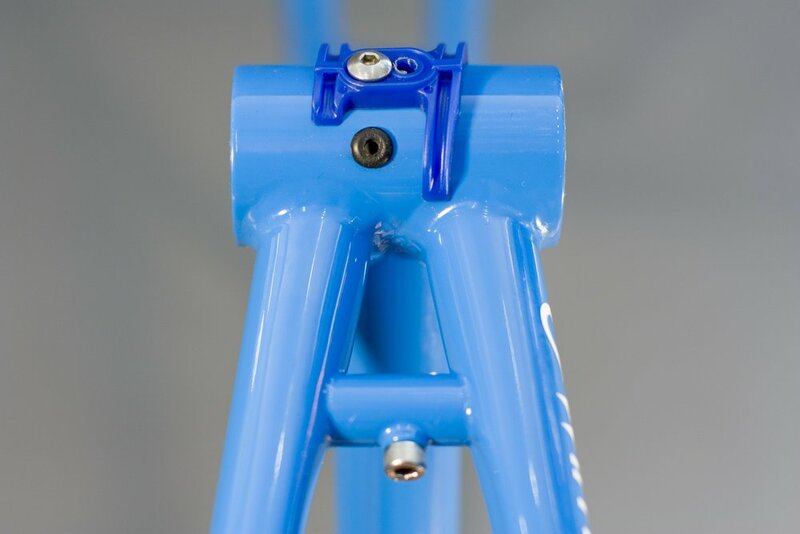 "Pelican Blue" powder coat finish with a corrosion preventative primer base. Clearance for 650bx42mm tires with fenders and 650bx45mm without. We offer the Pelican in stock sizes from 50-60cm, increasing by 2cm at each size. Measurements are taken center-center of each tube juncture.